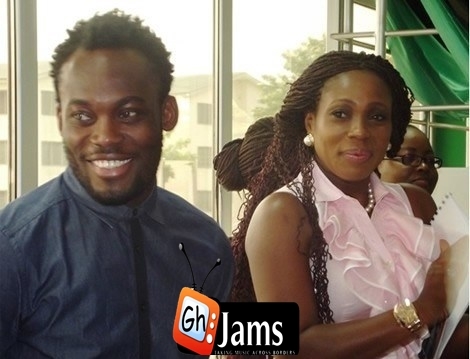 Ghanaian footballer and Chelsea star Michael Essien is married to his publicist, Akosua Puni, this is said to be a rumour, beacause they both never denied or confirmed yet. The report was regarded as mere speculation until last week Friday when Akosua introduced herself as Mrs Akosua Puni Essien at a cocktail charity event - Game Of Hope - organized by Michael Essien. Akosua was in charge of the event and everyone who worked with her referred to her as Mrs Essien. The Ghanaian showbiz personality and socialite is also the head of the Michael Essien Foundation. Michael and Akosua had a child together shortly after his relationship with Nadia Buari ended a few years back, though the football star has never acknowledged being married and does not wear a ring. Essien has three kids from two different women.